Luckily I’ve been able to finally read the novel for my English R1A class, so yes, this pertains to both the original 1977 Stephen King novel and his now iconic 1980 film adaptation by Stanley Kubrick. The very basics of both the novel and the movie: An unemployed writer lands a job as the caretaker of the eerie Overlook Hotel over the winter, mysterious forces lead to his insanity, and he attempts to murder his wife and son. While reading the book, I couldn’t help simply imagining every scene as the film presents, so essentially I was going through the movie in my head, except of course for half the stuff that’s in the book but not in the movie, and even if the wife, Wendy, is blonde and beautiful in the book but in the movie she is… not. 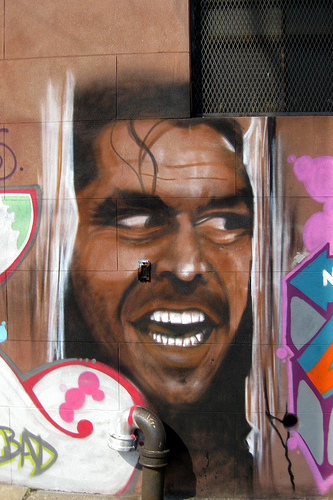 Although the movie is largely devoid of all the major, significant themes that Stephen King presents, such as the hazards of drinking, the disintegration of family bonds, and the supernatural forces that prey on our insecurities, the two should definitely be thought of as two separate entities, for both have redeeming and distinct qualities. Basically the film is undeniably a dazzling display of terror and special effects, but it does not go much beyond that point. The film ignores the major subplots and background stories that give the book the psychological and humane levels of interest that make it so involving and gripping. A hundred pages (if not more) in the novel that describe Jack’s history as a struggling writer and alcoholic who battles between his thirst and commitment to his family are literally reduced in the film to a seven-second scene that shows Jack staring blankly and menacingly into the camera (accompanied by a wonderfully scary score, nonetheless). The problem with the film is that Kubrick doesn’t bother with making Jack a sympathetic character, unlike in the novel, where I actually felt bad when he was about to axe (or rather “roque”) his wife to death (because that’s how good King is) or with making the supernatural forces an emanation of the characters, but rather, the Hotel’s own evil forces. Nevertheless, Kubrick’s perfectionism does make for some chilling and deeply involving scary sequences in the film, including an iconic elevator that spills blood. Next Next post: Lost in Translation: Your Service is on the Face!